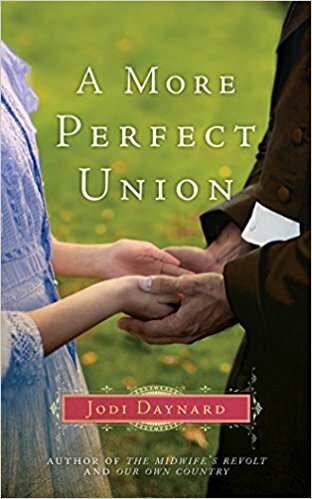 A More Perfect Union by Jodi Daynard is the third book in the Midwife trilogy, and follows the mixed race son (Johnny) of Eliza Bolyston and Johnny Watkins. The book opens in 1794, some 15 years after the events of books 1 and 2. Johnny Watkins, “passing as white”, returns to Boston from the Barbados to receive an education at Harvard. Union effectively illustrates the tumult of the early Republic and the vicious politics between the Federalists (supported by Johnny and John Adams) and the Republicans (supported by Thomas Jefferson). Set within a more personal framework, this bitter backdrop serves as a mirror to Johnny’s coming of age, as well as how he fits into romantic relationships–namely, learning the difference between love and lust, between what is hard, but right vs. what is easy, yet soul-taxing. Johnny’s two love interests, Kate and Marcia, perfectly embody each: Kate as Federalism and wanting Johnny to be himself vs. Marcia as Republican and wanting Johnny to pass as white. On the topic of character, I sometimes felt myself wondering what was the point of some. For example, although Johnny’s friend Eliot is endearing and intelligent, I couldn’t quite understand why he was in this book since Johnny and Kate would have interacted regardless of Eliot. Furthermore, Johnny’s first Harvard roommate, Peter Fray, ominously breezes in and out of the story, with the reader being merely told he’s the villain rather than shown it. Johnny is the catalyst for an event in Peter’s home in VA (I won’t say what – no spoilers), but when Peter presumably uncovers Johnny’s involvement, there is really no consequence except an unconfirmed incident years later. There is no closure with his character, nor explanation as to why/how he says and does what he does when he peeks into the story. In this way, I would have to say again that I was disappointed that Union followed suit with the other books in the series with its glossing over of important events and emotions. Very important information is casually dropped into a sentence without much time to dwell, rather than revealing this information through dialogue or inner thoughts over time. For example, we learn the fate of Eliza and Johnny Sr’s relationship merely in passing, and that felt very unsatisfactory and anti-climactic. There was no closure, just as there was no closure with other central characters of Union. And on the topic of inner thoughts–Daynard has a tendency to head-hop which can get confusing if you’ve already accepted Johnny as the close third person perspective. The emotional crux of Union is Johnny’s conflict regarding his mixed heritage, but this issue seemed largely ignored until about 90% through the book (with a few exceptions). I will give Johnny the benefit of the doubt and say that he was just young and naive, but for most of the narrative he comes off as shallow and self-absorbed. He frets here and there about slavery, but he never actually pronounces himself an abolitionist. He seems to only worry about furthering his own career and social standing. For lack of a better word, Johnny is a hypocrite and complicit for most of the book. I wanted to shake some sense into him over his misplaced affection for the vapid and cruel Marcia (I don’t believe she ever loved him). I know this sounds harsh because I do recognize that in reality, Johnny couldn’t really do anything other than better himself–but the way in which he was doing that seemed like it was only for himself and not with the intent to legally help slaves or free blacks when he had the intent to become a lawyer. Yes, he had aspirations to become a politician, but it came off as vanity rather than for the greater good. But, I will say that Johnny does learn his lesson in terms of the aforementioned points! Johnny’s transformation to embracing his heritage and true identity does not come until the very end, and even then his hand is forced. And if it had not been, would Johnny have ever revealed his true identity to those close to him? Would he have ever declared himself a man of mixed race, as well as an abolitionist? I’m not confident that he would, to be honest, because he held his tongue for so much throughout Union so that he wouldn’t compromise his career or his standing with Republican Marcia. But I must also recognize that at this time there were probably many “white passing” free blacks who played their cards very carefully for the very same reasons Johnny does. The reader has some satisfaction at the end, however, although events are largely compressed, summarized, and rushed as was the case with the other books in the series. And we only really see a slice of the election of 1800, as Union is more about Johnny’s finding himself. Ultimately, however, I was disappointed by the lack of some emotional, slowed down scenes that really could have packed a punch rather than merely glossing over events in two sentences. I was also left unsatisfied on account of some characters’ fates. We’re never shown the why and/or how of some characters’ motives and actions, and in the end, I didn’t find Johnny’s romances to be anywhere near as compelling as his mother’s story.